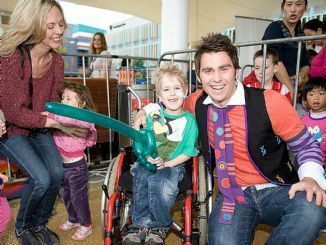 Terminally ill Levi McCormack had one of his wishes come true on Sunday when he met ABC funny man Jimmy Giggle at the Rouse Hill Town Centre. Levi was born with a very rare hypoplastic left heart syndrome and has spent most of his eight years in hospital. “Levi is a happy, really resilient boy who has a wish list of things to do,” his mother Karina McCormack, told the Rouse Hill Times. “In December, we were told his condition is terminal and we don’t know how long he will live. It can be a day, a week or month. “We have been watching Jimmy Giggle for quite a while and find him funny and bit nutty. Karina and her husband Ashley, who have two other children James, 6, and Keshia, 2, moved to Melbourne before Levi was born so that he could have the surgery he needed to survive. “He has his first surgery when he was three days old and since then five open heart surgeries,” his courageous mother said. “His condition is very rare and meant he was born with only half a hearty. “Except for one year, he has been in and out of hospitals and has actually lived a bit longer than we were told. “Levi loves food and watches cooking shows, specially Master Chef, telly or the internet. Levi, who is being fed through a tube, remains totally alert and very responsive, according to Mrs McCormack. “We relocated to Rouse Hill a couple of years ago to be close to our families but one of Levi’s wishes to see the place he was born at least once,” she said.